Following their Beautycon appearance, the cast of 'Little' Issa Rae, Marsai Martin and Regina Hall and more attended the LA premiere yesterday evening(April 9th) at the Regency Village Theatre. Marsai Martin who also is the movie's producer, wore a custom PAMELLA ROLAND coral strapless, ruffle tier high-low hem gown. In a way, I want to rip that bottom half off with the train because this would have been an amazing knee length dress on her. However but that color is a winner. Her beauty look complimented her playful, feminine dress, which she topped off with SAM EDELMAN sandals. Storm Reid stepped out in a purple MISSONI mock neck dress, which she styled with STUART WEITZMAN sandals. Her beauty look is flawless and while metallic sandals would have worked here, her neutral hue works as well. Issa Rae served up some leg action wearing a BALMAIN SPRING 2019 black sequin mini dress, with a plunging neckline and exaggerated sleeves. While the bandeau looks great with the dress on the runway, Issa pulled it off without. However I wish she kept the runway's heels but she still nailed this look. Regina Hall worked the split on her RALPH & RUSSO FALL 2018 metallic printed, pleated v-neck dressm, which she paired with metallic STUART WEITZMAN sandals. If I had to add anything, it would be a burgundy lip color. 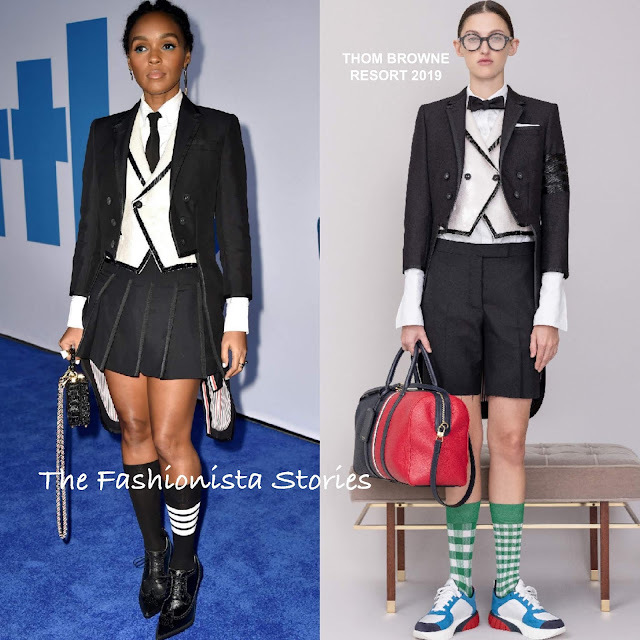 Janelle Monae rocked her signature hues courtesy of THOM BROWNE. Her RESORT 2019 masculine inspired ensemble, had a preppy feel to it as well. 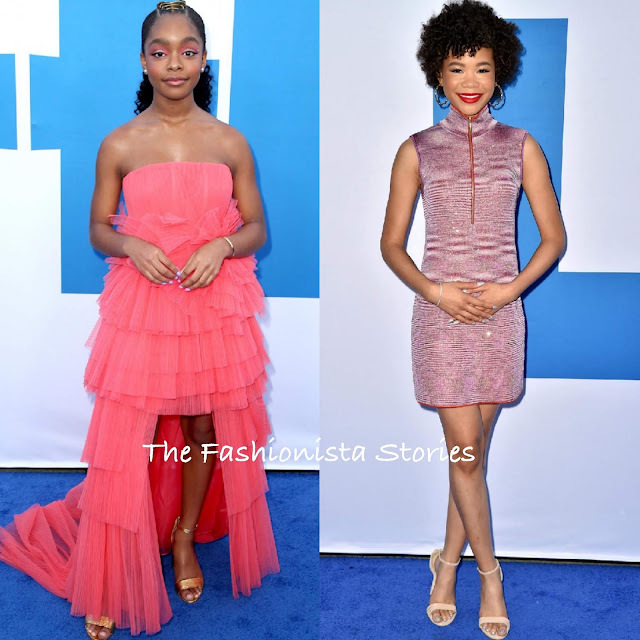 Skai Jackson stood out in a green strapless ruffle organza panel mini from the RONALD VAN DER KEMP FALL 2018 COUTURE collection. Instead of wearing silver metallic accessories, she opted for a black clutch and SOPHIA WEBSTER sandals. Beauty look is flawless.